LAWRENCE, Kan. — Perry Ellis grabbed a double-double of 27 points and 13 rebounds and had solid support from three other starters and No. 1 Kansas endured a career night from Buddy Hield to beat No. 2 Oklahoma 109-106 in triple-over time in a Big 12 college basketball matchup on Monday night. Devonte’ Graham score 22 points, including the go-ahead free throw in the third overtime, to go with seven rebounds, Wayne Selden Jr. added 21 points and Frank Mason III ended with 15 points, seven rebounds, six assists and three steals for the Jayhawks (13-1, 2-0 Big 12), who handed Oklahoma its first defeat of the season. Hield, who started the game very strongly, finished off with a career-high 46 points for the Sooners (12-1, 1-1), but he had two bad turnovers in the final period of the game. He made eight 3-pointers on the night, but missed a potential tying 3-point attempt at the buzzer in the third overtime. Hield shot 13 of 23 from the floor and had eight rebounds and seven assists as well in the defeat. Jordan Woodard made six 3-pointers and ended with 27, Ryan Spangler finished with 14 points and 18 rebounds and Khadeem Lattin chipped in with 10 points, 14 rebounds and six blocks for the Sooners. Johnson, who shot 14 of 16 from the field, pulled down 16 of his total boards on the defensive end, while blocking three shots and picking up three steals for the Tar Heels (14-2, 3-0 ACC) who stayed undefeated in conference play after three outings. Johnson now joins Blake Griffin as the only players in the last 20 seasons with at least 39 points and 23 rebounds in a game, according to ESPN Stats & Info. Kevin Durant is the other with the milestone as well. 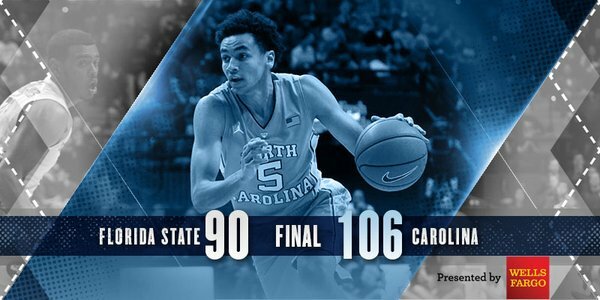 North Carolina is 3-0 in ACC for the first time since 2008 and has won three straight for third time under coach Roy Williams (2005, 2008 and 2016). Xavier Rathan-Mayes led Florida State with 30 points — knocking down 7 shots from 3-point range — while grabbing four rebounds and three assists. Dwayne Bacon had 18 points and seven rebounds and Malik Beasley added 15 points and eight boards for the Seminoles (10-4, 0-2 ACC) at Donald L. Tucker Center. North Carolina, as a team, shot 50-percent from the floor, while outrebounding Florida State 50-33. Joel Berry II scored 12 points and four assists for North Carolina, while Paige added five rebounds and five assists to his stats in the win. The Tar Heels will next play at Syracuse on Saturday, while the Seminoles, who have dropped two in a row, will battle No. 12 Miami (FL) on the road on Saturday as well.